Imagine you are standing on a blue velvet carpet in the center of a large hall decorated with lots of flowers. The hall is crowded with people who are all dressed up in a very festive manner; you yourself are clad in a suit that your spouse has had tailored for this appointment today. People look at you and smile, and when they talk to you they do so in a most respectful manner. It’s winter outside - December 10th to be precise - and you are in Stockholm. In September you received a phone call and a female voice congratulated you on being awarded a special prize honoring your outstanding work on consciousness. There is no doubt about it: the elderly gentleman in a tailcoat with a number of medals on his chest is the king of Sweden and he is about to award you a Nobel Prize in Medicine or Physiology. The whole scene makes sense to you and triggers positive emotions of joy and pride. There is no one who knows more than you about the neural mechanisms that integrate all incoming sensory information with information that has accumulated in your brain throughout your lifetime, and that allow you to experience this moment as a fully conscious person, as somebody who is fully self-aware: aware of your biography with its ups and downs, aware of the significance of this moment for yourself and for your family, and aware of its implications for your future. If you didn't have such a sophisticated level of consciousness you might simply wonder about the material value of the gold medal that you are about to receive, or you might ask the elderly gentleman for the nearest location of a particular fast food restaurant, or you might approach the gentleman or the woman who would sit next to him and try to engage sexually with them. From an evolutionary point of view there is nothing wrong with behavior that involves finding out about food sources or that might result in a successful mating attempt, but conscious behavior clearly seems to have advantages over non- or less-conscious behavior. 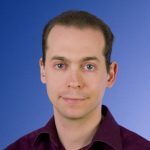 Daniel Bor explains what we know about this particular type of information processing in the brain, an ability that we as a species are so proud of. Most of us have experienced moments of exquisite pleasure when fitting that last piece into a jigsaw puzzle, or writing that last number in a Sudoku grid. From a biological point of view, what brings us pleasure is usually related to what keeps us alive and enables us to reproduce. But the enjoyment received via puzzles is at first sight an anomaly – it doesn't provide us with food or shelter, and it certainly doesn't bring us closer to a sexual mate. Scientists like me love these apparent exceptions to the rules. To us, they are the scientific puzzles that most motivate us in our work. In this case, humanity’s bizarre love of patterns in games may well be the key to unlocking the purpose of consciousness. But to arrive at that completed scientific-crossword clue, I first need to describe what the puzzle of consciousness looks like. Questions of consciousness in one form or another have been a favourite source of debate between philosophers for centuries. Although this article is primarily about the science of consciousness, I want briefly to raise three philosophical questions, but then answer them from a scientific point of view. First, as René Descartes argued four centuries ago, is consciousness independent of the physical world, and specifically independent of the activity of our physical brains? The short answer is no. As one example, I have at times been in an fMRI scanner, and a colleague was able to decode my consciousness state, effectively performing scientific telepathy, simply by observing my brain activity. All the evidence points to consciousness being a physical process, carried out by the brain. Reducing our consciousness, and everything that mentally comprises us, to a small sack of jelly, a mere kilo in weight, can be disconcerting for many. But as a neuroscientist, I find this fact thrilling, even inspiring, because of the details of that small, spongy object: The human brain is, by quite a distance, the most complex object in the known universe. There are 85 billion neurons in the average human brain, with each neuron connected to, on average, 7000 others, making 600 trillion connections in all. Inside each human skull, this cabling connecting neurons together is 165,000km long, enough to wrap around the world four times over! So saying that consciousness is a physical, brain-based process, is something to be proud of, even to feel wonder at. Onto the second philosophical question, which John Searle raised in the late 20th Century – can you really boil consciousness down to just computational rules? Or is there something uniquely non-computational about human consciousness and meaning? Actually you really can boil consciousness down to computational rules, because that is how the human brain works – whenever we examine neurons in detail, they are performing very clever computations, albeit of a different kind to that in your PC. Nevertheless, computations they are, and increasingly successful and accurate computer simulations of brains are currently being built (see, for instance, the Human Brain Project, a flagship project of the EU). Third and finally, back to Descartes in the 17th century, is there intrinsically, inevitably something special, even unique, about subjective experience? If on holiday, say, I were to look at a glorious mountain range, hear the birdsong in the trees nearby, feel the breeze on my cheeks, and the sense of peace and awe from such a place, no one else could ever experience precisely what I experience at this moment. 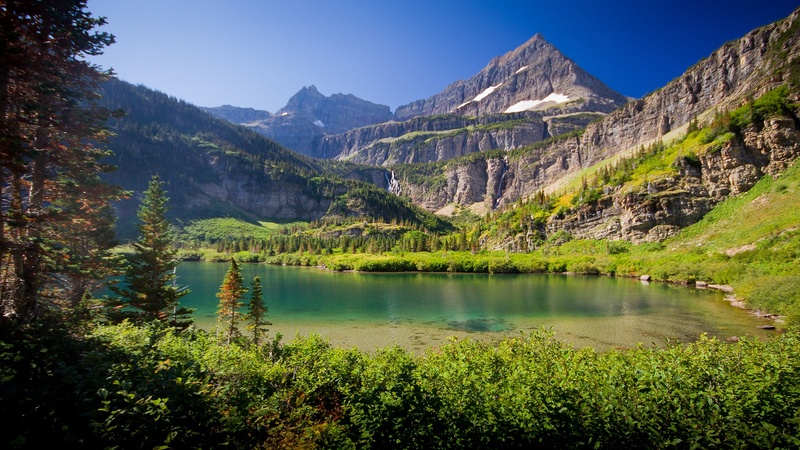 Atsina Lake, on the way to Stoney Indian Pass in the Glacier National Park, Montana, as experienced by Jeff P. on 11th of September 2013 (Image credit: Jeff P, flickr). But is this prison of experience a unique characteristic of consciousness, which any science might struggle to unlock, or merely an accidental design constraint, because our brains aren’t computationally connected together? I would definitely argue it is an accidental design constraint, and one we can potentially engineer our way out of. If we assume, as most neuroscientists do, that the brain is a kind of computer, then it’s possible, in principle, at some future date, for all the details of our brains to be copied onto a powerful computer. At that point, can the program of a person be combined with another or more than one, just as networks of computers join forces now? I’m not saying this is certainly going to happen – just that the possibility shows that subjectivity might merely be a technical matter, with future scientific and technological ways of eroding it. Indeed, we are already making baby steps towards this future world, as this clip illustrates. If you assume for the moment that rats are conscious, then the experimenters wired these two rats’ brains together in such a way that the right-hand rat could in some sense “see” what the left hand rat saw, sharing its consciousness (Video credit: from Pais-Vieira M et al., 2013, Sci. Rep. 3: 1319). Is such a setup possible in humans, in principle? There’s absolutely no reason why not. In fact, by biological accident, in some ways, it might already have happened, in two girls called Krista and Tatiana Hogan. They are fun, relatively normal twins, from Canada, except that they are conjoined twins, joined at the brain – they share an important part of the brain called the thalamus. As you can see from this video, each child seems to be able to experience some of the senses of her twin. For instance, one of the twins can internally sense that the other is thirsty and will go and get a drink for her. And when one twin has ketchup, the other, who doesn’t like ketchup, will try to scrape it off her own tongue. So here subjectivity isn’t limited to one person, and can seem to spread across to another, violating the idea that it is intrinsically personal, isolating, at least in this provisional case. Is the consciousness mind superior to the unconscious mind? So assuming that consciousness is a physical, computational process that doesn’t have to be intrinsically private, we should indeed be able to explore it scientifically. Focusing first on the psychology and then the neuroscience of consciousness, one starting question we might want to ask is in which situations is the conscious mind superior to the unconscious mind? The answer is: almost all situations. We need consciousness for a range of complex processes, including logical operations, cause and effect, and most kinds of sequential information, as well as any non-trivial mathematics . This hints at the purpose of consciousness, but before I get to that question, I want to describe one intriguing exception to the rule that consciousness is superior. Consider the following experiment where either pro golfers or novices took part. The main task is simply to putt a golf ball in the hole. Both groups either concentrate on their swing technique as they try to putt, or they are distracted by an auditory task – listening for target beeps on headphones, as they are putting. The pro golfers are better at the task when they are distracted by the beeps, whereas the novices are better at the task when they concentrate on their technique. So this experiment, and others like it, suggest that once we have become experts on a particular skill, consciousness actually can get in the way of performance. But it’s still useful, if not essential, at the early stages of learning a complex skill. But despite the fact that consciousness is so important for all these complex tasks, and to set up our expertise in the first place, it is in many ways incredibly limited. To give you an example, look at the two pictures below, and try to spot the difference between each. This is an animated gif switching between two images. Can you spot the difference? (Image credit: Ron Rensik). You most likely took a long time to spot the very obvious difference. This, an example of change blindness, illustrates that our consciousness only really focuses on a small handful of features of the world at any one time. But, critically, those objects aren’t boring things like pixels or the smallest components of sounds. They are fully formed mental objects, like a person, or a car, and it rarely occurs to us that our brains have performed a herculean feat to convert all the raw information to that completed, multifaceted object. The first question relates to levels of consciousness, with being normally awake at the highest level, a dreamless sleep lower and under general anaesthesia and coma somewhere near the bottom levels. So how does the brain ramp up and down our levels of consciousness? The second key question is, when we are fully awake and normally conscious, what distinguishes the different kinds of experiences we can have? What in the brain, for instance, changes when we switch from seeing a rose to hearing birdsong? In terms of the first question, we can explore how brain activity changes as consciousness level does. This question can be explored in various ways: you can compare brain activity in normal volunteers with that of vegetative state patients (who have suffered severe brain damage, have no real consciousness left, but do show sleep waking cycles); or you can see how brain activity changes in volunteers who start normally awake, but then their conscious levels are reduced because of sleep or sedation. 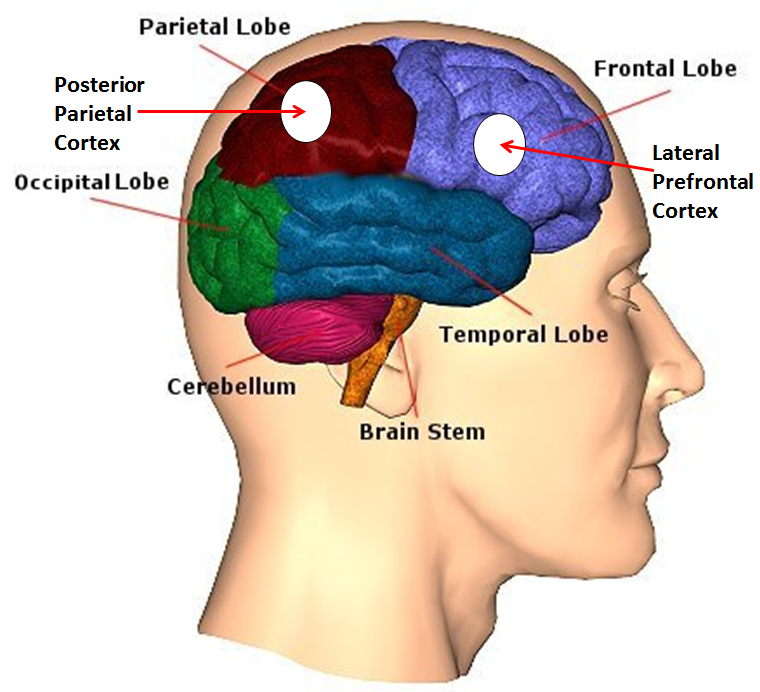 Location of the lateral prefrontal cortex and the posterior parietal cortex in the human brain (Image credit: adapted from istockphoto). In all these cases, a common set of brain regions reduce in activity as conscious levels drop , and these are the lateral prefrontal cortex and the posterior parietal cortices – commonly grouped together as the prefrontal parietal network . Are the same brain regions implicated when we are awake and we switch between different kinds of conscious content? How do you even explore changes in conscious content? This is a trickier question than it sounds – if we present subjects with a view of a rose in the scanner, and compare that with the sound of birdsong, the striking difference in the stimuli might themselves cause many brain changes, independently of whether those changes relate to consciousness. Rubin's vase (left) and "My Wife and My Mother-in-Law" by W.E. Hill (right) (Image credits: public domain). It’s an interesting and striking fact that we only ever see one or other of these options – very rarely some combination of the two. And our experience will regularly flip between, for instance, seeing a candlestick or vase and seeing the faces. In the brain scanner, you can record when consciousness switches, by the volunteering reporting this using buttons, even though the stimulus stays the same, and in this way find out just which brain areas are associated with consciousness. When you do this the main result is that the same two key brain regions increase in activity in relation to the switch in perception. These are the same regions that were implicated in the conscious levels experiments, such as with general anaesthesia, that I mentioned a moment ago. And these regions are the prefrontal parietal network again. Now why should these two brain regions be so closely associated with consciousness? 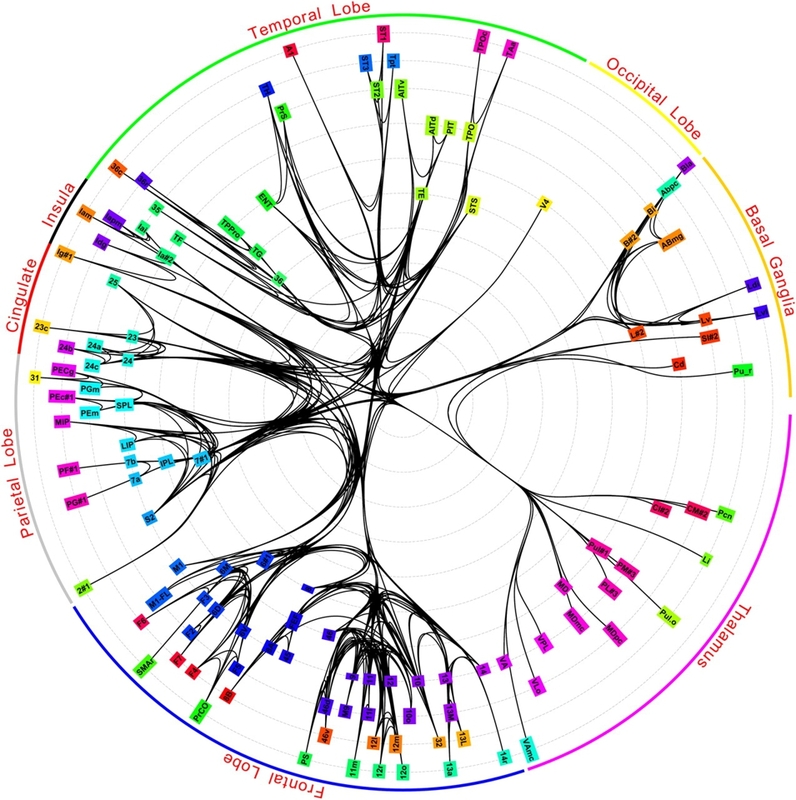 The network architecture of the long-distance pathways in the macaque brain (Image credit: from Modha DS and Singh R, 2010, Proc. Natl. Acad. Sci. USA 107: 13485-13490). This picture is a schematic of how all the major brain regions are connected together. In the lower left there’s a clearly more dense web of cabling between brain regions. Within this, the thickest section at the bottom is the lateral prefrontal cortex and the thickest part on the left is the posterior parietal cortex – in other words the prefrontal parietal network again. So these two regions are the most highly connected brain regions that exist. They are densely connected with each other, but also with most of the rest of the brain – the visual regions, auditory regions, and so on. This link between consciousness and these most densely connected parts of our brains chimes closely with one of the fundamental psychological features of consciousness. One important function of these regions is that they are drawing together, and are able to temporarily store, information from every other nook and cranny of the brain. This combination of information means that when you look at a chair, say, you don’t see millions of different pieces of visual information separately. Instead, you see it as a single object, you can connect up your senses so that you are conscious both of its shape and function together. One of the hallmarks of consciousness is that it combines, unifies information together from a range of sources, into single high level mental objects, and the best place for the brain to do this is its most central, most connected hub, the prefrontal parietal network. This summarises where in the brain consciousness occurs, but what about “when?” This is a trickier, more complex question, but in general it takes about a third of a second for consciousness to arise in response to any event in the outside world, and the most closely connected brain rhythm to consciousness is the fastest one we have, gamma, which is 40 Hz or more. Why such fast brainwaves? Well, this might relate to their ability to carry more information, which fits closely with both one role of the prefrontal parietal network I mentioned above, as well as the prevailing theories of consciousness. The growing maturity of this field has meant that the main current theories are converging on similar claims for the nature of consciousness. They generally claim that consciousness needs a particular kind of network structure and pattern of activity – it could be a brain network, or a computer network, but it needs both sparsely connected areas, for the specific information, such as visual information, and central hubs of dense connectivity. But for these central connectivity hubs actually to be conscious, they need both back and forth communication. Finally, the main theories roughly agree that consciousness is about information, at least when it’s of this combinatorial form, for instance allowing me consciously to perceive my daughter as one single unified object. And the latest ideas for what this will look like in the brain is that it will be the most complex neural signals that will be the most conscious ones. One particular theory worth mentioning is Intregrated Information Theory, by Guilio Tononi . It is one of the most popular current theories of consciousness, although it also has more than its share of critics. It posits that just as you have physical features of the universe, like electromagnetic waves and matter, and so on, when you have those physical features arranged in such a way that they are processing a combined, integrated form of information, there will be consciousness. So consciousness just is a kind of information, which is supported by a network of a particular architecture. The theory is utterly ambivalent about what the network could be made of – could be neurons, but could just as easily be silicon. The general theoretical assumption therefore is that consciousness is associated with processing of information in a particular way, and that all subjective experiences, including primordial emotions (hunger, thirst, pain, etc. ), self-awareness, semantic information, etc. if they are conscious experiences, are conscious because they involve information processing, and that maybe self-awareness is just a more complex informational process than primordial emotions, and emerges with a more sophisticated brain, which provides both higher intelligence and higher-order consciousness. The Integrated Information Theory, ambitiously, gives a mathematical quantification of the amount of consciousness present. And, somewhat related to this, other researchers, myself included, use brain measures of information to provide a single number to index how conscious a person is, and explore consciousness based on these results. For instance, it’s been found that although normal wakefulness has the highest “conscious level number,” dreaming sleep isn’t far behind, and is higher than a dreamless sleep . More recently in a fascinating study, a colleague of mine demonstrated that such brain-information numbers are higher if you have just taken LSD compared to not being on such a drug . But can we glean any more information about what the purpose of consciousness is, and its nature, from the neuroscience? One thing you can do is ask what most activates the prefrontal parietal network. Is there some process that drives it above all others? If so, perhaps that special process is also most intimately linked with consciousness. One answer to this question, from my own research, is the process of finding ways to innovate your way out of a challenging task. In one of my brain-scanning experiments, subjects in each trial had to recall a novel sequence of numbers . Sometimes these sequences were pretty random in nature, such as 38 91 27 58. But at other times, they were highly patterned, or structured. For instance, 21 32 43 54, going up by 11 each time. Subjects were able to spot the structure here to make those trials considerably easier. In the fMRI scanner, these easier, more structured trials yielded extra activity in the prefrontal-parietal network. In fact, from this and other studies I and others have carried out, this generation and use of pattern-based strategies is about the most robust activator of the prefrontal parietal network that you can find . So a key role for the prefrontal parietal network is to find and use patterns in order to improve task performance. Is that also a key role for consciousness? As I mentioned, a key feature of consciousness is that we have these unified, combined experiences, so that when we view a chair, we can’t consciously see it as just a bunch of component parts. We have to recognise it as a chair. But this isn’t just a feat of combined information in any old random way, but of hierarchical, highly structured information, as we seamlessly combine all the visual elements together in order to recognise the higher level concept – chair. So consciousness is intimately about detecting and using structured information, to help us improve, to get ahead in a difficult world. From all this, I believe that the central, evolutionary purpose of consciousness is a kind of ideas factory…. When automatic habits won’t help on important novel or complex tasks, consciousness steps up to find deeper useful patterns and innovative solutions. In humans this just happens to be such a particularly aggressive, normally active process. Therefore, enjoying puzzles, rather than a mental cul-de-sac, may reflect the core function of consciousness. It is exactly such pattern-spotting that both explains why we have such an expansive form of awareness, and are such a dominant animal species via our stupendous intellectual feats. So, the next time you solve a Sudoku grid, the pleasure you feel might be evolution’s way of telling you that, far from a waste of time, such activities are the essence of what it means to be human.